Christian IV understood well that the men in his navy and in his army might be more loyal if they had reasonable accommodation and some rights to housing after they retired from his service. Construction of the naval accommodation of the Nyboder housing scheme, designed by the Flemish stone mason and architect Hans van Steenwinkel the younger, began in 1631 and by 1648, the year that Christian died, there were 600 housing units in the streets laid out north of the city, on land just beyond the king’s house and garden of Rosenborg. 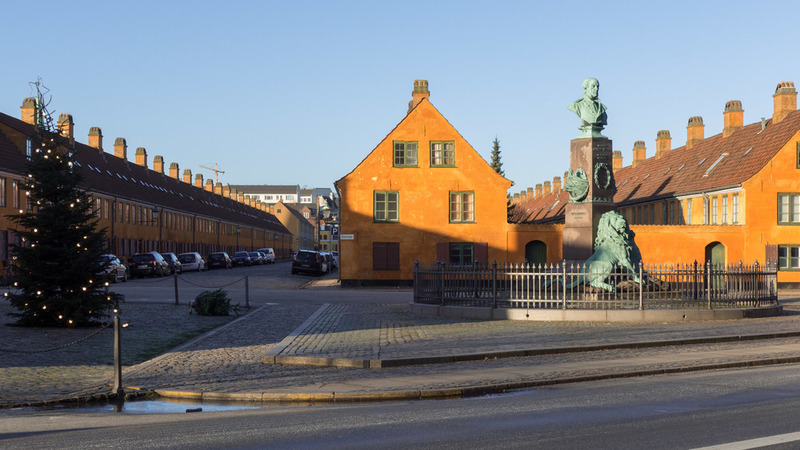 Initially, these houses were outside the city defences but work on the Kastellet (Citadel or fortress) and its earthworks and defensive water-filled ditches, immediately north of Nyboder, began in 1658 under Christian’s son Frederik. As the Kastellet included houses for the garrison so Nyboder then became part of an extensive military area which had its own guard houses and a parade ground on what is now Grønningen. The city defences - embankment, ditches and bastions - were extended from the north corner of the city round to link to the new Kastellet to bring Rosenborg and Nyboder within the defended area so Nyboder was then just inside a new east gate to the city that was constructed to replace the old east gate at the east end of the street now known as Strøget. Although the earliest single-storey buildings appear to be a line of terraced houses in rows, they were in fact subdivided along the line of the ridge with a one or two-room apartment on the street and a similar separate apartment on the yard side and with a shared entrance and shared cooking hearth in the cross passage. Steep ladders also in the cross passage gave access attic rooms in the steeply-pitched roofs. There were water pumps and earth closets in the yard … toilets where ‘night soil’ was covered with ash from the fires or with dirt to keep down smell and these were then emptied by men with carts with the waste used, presumably, for fertiliser on garden plots outside the city. Additional rows were added through the late 17th and the 18th centuries. Later row houses, built around 1758, were two full storeys high and were designed by Philip de Lange and further two-storey terraces were built in the late 18th and early 19th centuries.